BUA Cement has announced the completion of the construction of its newest Cement Factory- the three million Metric Tonne Per Annum (MTPA) Obu II Cement Plant in Okpella in Edo state. Mr. O’tega Ogra, the Group Head, Corporate Communication, said in Lagos on Thursday that the new plant came less than six months after the inauguration of the company’s 1.5 million MTPA Kalambaina Cement Plant in Sokoto State. Ogra said that the date for inauguration of the factory would be announced soon. The Chairman, BUA Group, AbdulSamad Rabiu, said that the completion of BUA’s Obu Cement 2nd line puts the company’ s product in prime position to be Nigeria’s second largest cement producers by volume in a short while. “BUA Cement has in no time become the industry leader in capacity utilisation as well as maintaining a strong presence and brand leadership position in regional markets where it operates. “By virtue of its location in Okpella in Edo State, BUA Obu Cement plants are five hours away from all the major markets across Nigeria,’’ he said. He said that the nature of the formulation of BUA Cement’s products and the products’ strength had seen it dubbed, ‘King of Strength’ by block makers and others in the construction industry. According to him, the plant has the capacity to run on multifuels - gas and heavy oils. 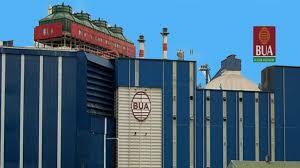 BUA Group had in 2017 announced that it built a 50-kilometre pipeline to carry gas to fire its gas turbines at Obu Cement Plant.